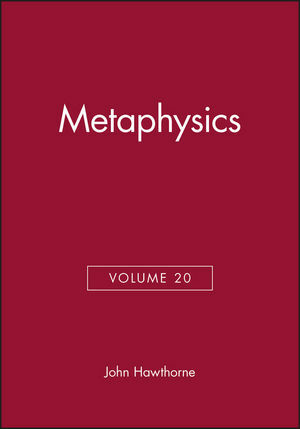 Philosophical Perspectives Volume 20, Metaphysics, contains over 15 articles from leading philosophers of Metaphysics. John Hawthorne is Professor of Philosophy at Rutgers University. He has published numerous articles on metaphysics, philosophy of language, epistemology, philosophy of mind, and early modern philosophy. His books include Knowledge and Lotteries, Substance and Individuation in Leibniz (with Jan Cover, 1999), and The Grammar of Meaning (with Mark Lance, 1997). I FRANK ARNTZENIUS, Infinity Relativity and Smoothness 1. II GEORGE BEALER, A Definition of Necessity 17. III PHILIP BRICKER, Absolute Actuality and The Plurality of Worlds 41. IV BERIT BROGAARD, Two Modal–Isms: Fictionalism and Ersatzism 77. V MATTI EKLUND, Neo-Fregean Ontology 95. VI ALEX OLIVER & TIMOTHY SMILEY, What Are Sets and What Are They For? 123. VII IAN GIBSON & OLIVER POOLEY, Relativistic Persistence 157. VIII CODY GILMORE, Where in the Relativistic World Are We? 199. IX BORIS KMENT, Counterfactuals and the Analysis of Necessity 237. X KRIS MCDANIEL, Modal Realisms 303. XI L. A. PAUL, In Defense of Essentialism 333. XII CAROLINA SARTORIO, Failures to Act and Failures of Additivity 373. XIII THEODORE SIDER, “Bare Particulars” 387. XIV ZOLT´AN GENDLER SZAB´O, Counting Across Times 399. XV GABRIEL UZQUIANO, Receptacles 427. XVI PETER VAN INWAGEN, Names for Relations 453. XVII BRIAN WEATHERSON, The Asymmetric Magnets Problem 479.